A Filipino preacher who claims to be “the appointed son of God” has been featured in a book about the world’s self-declared Messiahs. Norwegian photographer Jonas Bendiksen travelled the world tracking down men who claimed to be Christ. Among the self-declared Messiahs is Apollo Quiboloy, leader of the “Kingdom of Jesus Christ, The Name Above Every Name“. The Davao-based megachurch empire claims a global following of six million people. 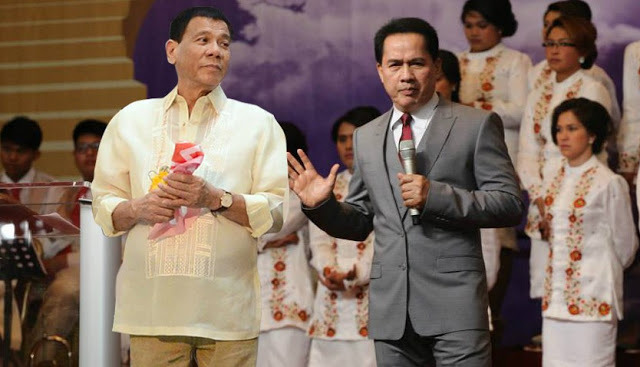 Quiboloy also counts President Duterte among his friends, and enthusiastically backed the former Davao mayor during last year’s election campaign. Among his claims is that his God visited his mother in the form of a cloud to declare him as His son. Members of his church, called “Kingdom citizens”, believe that salvation is impossible for all non-members, including Catholics. Despite the outlandish claims of Quiboloy and others, Mr Bendisken said his book — The Last Testament — did not pass judgement on the claimants to Christ’s Throne. “While my story is about these Messiah claimants, my overriding theme is the mechanics of religion itself,” he said. “My aim is to use this project to open a debate about faith. Vissarion of Siberia lost his job as traffic cop in the Siberian town of Minusinck in 1988. He had his first revelations that he was Jesus Christ as the USSR collapsed around him. His community currently numbers some five thousand followers who have built their own schools and churches, formed a priesthood and their own social structure. INRI Cristo had his first awakening in 1979 during a fast in Santiago de Chile. After spending many years as a wandering preacher he settled in what he calls New Jerusalem outside of Brasilia, Brazil, where he lives in twelve disciples and disseminates his teachings through YouTube, music videos and live broadcasts of his sermons. A former MI5 agent who blew the whistle in 1996 on alleged corruption in the secret service, David Shayler/Dolores Kane lives in Middlesbrough, UK. He says he was anointed Messiah in July 2007 and claims to have divine powers that allow him to predict football scores, prevent terrorist attacks and change the weather. Moses Hlongwane was working as a small-time jewellery salesman when God came to him in a dream with the word that he was the Messiah. He currently has 40 or so disciples in South Africa. Jesus Matayoshi founded Japan’s World Economic Community Party in 1997, which bases its policies on his identity as Jesus Christ reborn. According to his campaign literature, he will first become prime minister of Japan before being offered the post of secretary general of the United Nations. Jesus of Kitwe received a revelation from God when he was aged 24 that he was the second coming of Jesus. Today he is 43, married with five children and operates two unlicensed taxis in Kitwe, Zambia. The Last Testament by Jonas Bendiksen is published by Aperture Books.